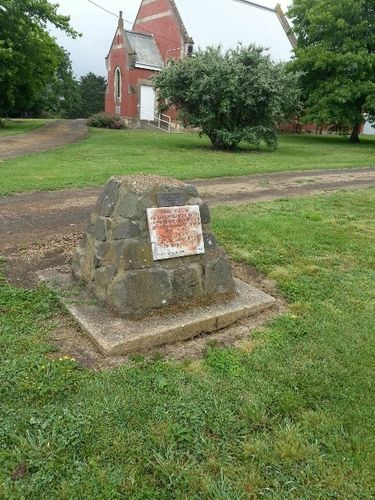 A cairn commemorates the founding of the Methodist Aboriginal Mission at Buntingdale. The Wesleyan Missionary Society established the first Victorian mission at Buntingdale near Geelong in 1836. Other missions and reserves soon followed and many were run as successful enterprises, largely due to the skills and labour of their Aboriginal residents. However, they soon came under pressure as surrounding settlers demanded more land for farming and other agricultural pursuits. In 1839 the Tuckfields arrived at Birregurra to establish the Methodist Buntingdale Aboriginal Mission where in spite of his devotion and enthusiasm the mission made small progress. Tuckfield found that while he could advance the education of the younger Aboriginals he could make little religious impact upon the tribes. The government became convinced that the mission was a failure and informed Tuckfield that the grazing licence, by which he now held the mission station, would be cancelled at the end of 1850. In spite of his dedication to the care of the Aboriginals and his persistence Tuckfield now had no alternative but to abandon the site, an unhappy outcome for both his church`s missionary zeal and the government`s humanitarian programme. There was a large attendance in the Birregurra Methodist Church grounds at the unveiling of a cairn commemorating the centenary of the founding of the Buntingdale mission to aborigines by Mr. L. J. Tuckfield, a descendant of the pioneer missioner, Rev. Francis Tuckfield. The inscription on the cairn is as follows:-"This cairn commemorates the founding of the Buntingdale mission by Rev. Francis Tuckfield on August 18, 1839, and was unveiled by L.J. Tuckfield, August 26, 1939." Age (Melbourne), 29 August 1939.